The way we move around is shaped by many factors — the physical environment, culture, technology, and economic status, to name a few. A new report from the engineering firm Arup, “Cities Alive: Towards a Walking World,” looks at how motorized cities can become walkable again. The turquoise circles represent % of journeys by walking. On the left is Los Angeles at 4%. And on the right is Istanbul at 48%. The red circles represent % of journeys by car. On the left is Miami at 79% (with Los Angeles right beside it). And on the right is Kolkata at 2%. The map in the middle of the circles represents pedestrians killed in traffic crashes per 100,000 people. I’m not sure where the data was drawn from, but it’s not all that surprising to see a few North American cities clustered towards the left (less walking; more driving). 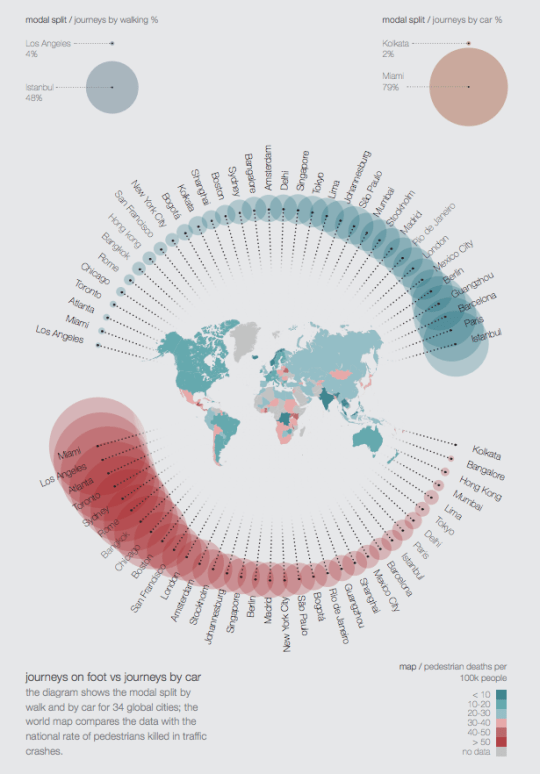 North America clearly stand out as a car-dependent part of the globe. Any other patterns emerge? Elsewhere on the Network today: Pedestrian Observations considers how transit agencies might successfully combine “radial” and “circumferential” routes. And World Streets asserts that achieving full gender parity in transportation decision making bodies would be transformative for cities. Which Places Got Complete Streets Policies Right in 2014? How Walkable Are the Streets Near Your Transit Stop?